Even people with a lot of hanging clothes don't need to allocate the whole closet to rods when a well-designed closet system is in place. This closet is simple and straightforward in design, but delivers approximately twice the storage of a standard closet for an economical price. Even a simple closet system like this one can double the amount of usable storage space. Spacious, clean and well-planned, this simple white closet is a staple in our offering, meeting all of this client's needs for hanging, accessories and folding storage. This is a very economical solution to custom closet design and storage, but it doesn't skimp at all on quality. This closet is made from the same high end components with identical manufacturing and installation techniques as our more elaborate closet systems. It offers a great value as an entry level custom closet and is made from much better quality and longer lasting materials than those typically found at your local do-it-yourself home improvement store. This homeowner opted to include a pull-out valet pole for staging the day's clothing. This will make it quick and easy to get going in the morning by organizing and slecting your outfit the night before. 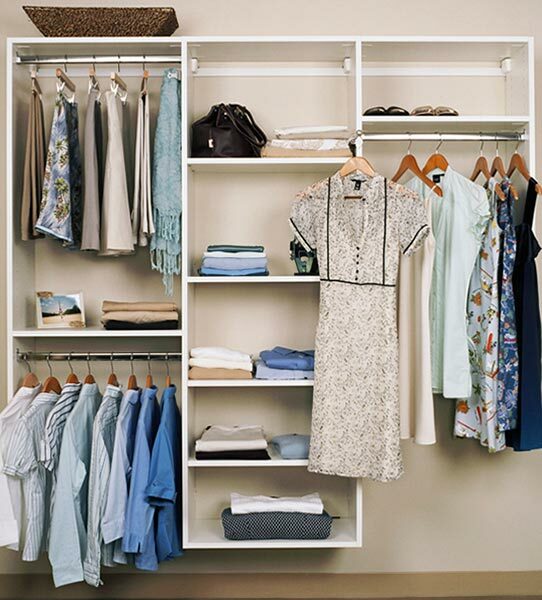 It is essential to keep your closet organized to help you save time in your day by finding things quickly. The fully bored panels in this system allow the owner to easily add more accessories like this at a later date if needed.